Police have found a young Brazilian woman deep in the Siberian woods in an Orthodox Old Believers’ community, left by her father to study and rewrite old holy texts. But her mother now wants her back in Brazil. Back in the beginning of the 20th century, after the October Revolution of 1917, Ustina’s relatives fled to Brazil and organized a community of Old Believers there. The young woman was born after her father married a Brazilian beauty. Ustina was brought up in the traditions of her parents’ beliefs and she says she liked the religion. However when Ustina was 23, her parents split up and her father took her back to his ancestral homeland – Siberia. 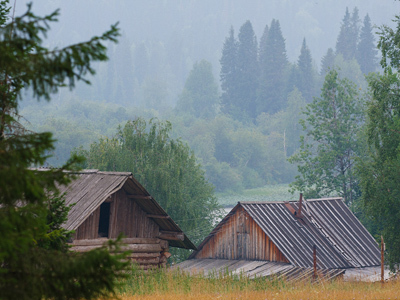 They dwelled in a small village deep in taiga forests among their religious fellows. The girl was involved in the rewriting of holy books of her community [Old Believers are against the printing of books]. Ustina’s mother apparently visited her in Russia. Her father eventually moved to Canada, leaving her alone. After Ustina’s mother lost connection with her daughter she contacted to Brazilian police. “Through Interpol, they sent a request to the Krasnoyarsk police department and the Brazilian–national was found in the old believers’ dwelling,” police confirmed. Ustina told the officers who found her that she could not reply to her mother’s letters, as a postal service is not easy to deal with when it comes to Siberian villages. “I really like it here in Russia, and I really don’t wish to leave!” says the now-26-year-old Ustina Chernishoff, standing on the airport tarmac. However, her visa expired and now she has to return to Brazil.